Nevertheless, in this blog I have shared some of what I have been up to over the last five months. 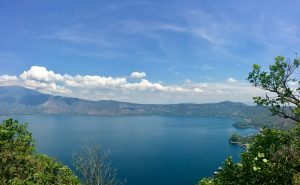 When I left Guatemala at the end of last year it did feel like the time was right to be leaving but it was a little strange finally leaving after living there for 7 months. I remember walking through the empty streets of Xela that last time on my way to get the 5am bus to cross the border into Mexico and even then there was still a part of me that thought the whole experience was a bit surreal. Living in the hills of Xela, Guatemala! I think when I look back years from now I will appreciate it even more. So, after Guatemala I headed to Mazatlán, Mexico for Christmas and the New Year, but surrounded by friendly faces it turned into three months. Living in apartment near the ocean, sun every day and the best of food. What it is not to love? One funny thing from my time there was that the football team I played with wore the full Arsenal kit. As a Liverpool fan, wearing an Arsenal kit and playing on some of the worst pitches I have ever played on I think I have once again demonstrated my commitment to football! Leaving Mazatlán was hard in a way because I started to feel settled there but I hit the road again, travelling through Mexico – Mexico City, Puebla, Cholula, Oaxaca City and the beach towns of Zicatela, Mazunte and Zipolite – before flying to Cuba and back to Mexico to the island of Cozumel via Playa Del Carmen. 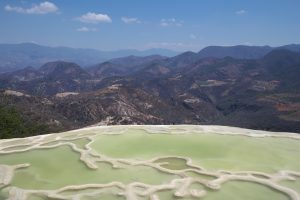 Overall, I have so many highlights from the Mexican road trip, so many beautiful places! 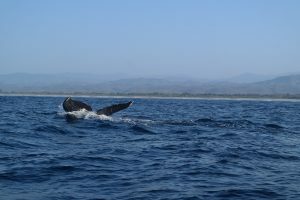 Seeing the humpback whales up close in Oaxaca was one of the standout experiences. I have been lucky enough to cover a lot of different parts of Mexico now but there is still so much more to see. I’ll be back! Next I flew to the colonial city of Leon in Nicaragua to catch up with one of my good friends I worked with at Alterna. Maybe I jinxed it when I arrived when I told him ‘I liked the vibe in Leon’ but things took a turn for the worse less than a week later. A country wide revolt against the government – or dictatorship – turned violent, buildings were being burnt down and people were being killed. That night we had a scare in a restaurant in Las Peñitas (a beach village half hour outside Leon) as the place turned to mayhem after people ran into the restaurant panicked shouting ‘they are coming, they are coming they have guns’. Pure panic ensued as everyone just ran for an exit. I was with my friend, his friend who owned a hostel there and his dad. The dad had been coming to Nicaragua for 20 years and I think his panic spooked all of us, in his frenzied state in the front seat of the 4×4 recommending we go to the hills. Later it was the ocean. Nobody really knew what was going on or who was coming. I think that is what it made it worse. And then given the history in Central America and Nicaragua you think anything is possible. ‘Are you coming to fight?’, a couple of lads asked us as we were trying to figure out what to do as calls were being made to get more information. That is not a question you expect to hear. It was incredible though how quickly the whole village shifted into defence mode as the locals rushed to the entrance of the town with guns, machetes or whatever they could find, to stop the ‘200 people on their way to destroy businesses’. To cut a long story short we ended up bunkering down in the hostel – with all the panicked guests – locked up with the lights off till late enough when the pick-up trucks full of locals passed by beeping the horns as if in victory. It turned out the ‘200 odd people’ never actually made it as far as the entrance to the town; they had been focused on a Mercado outside the town. As for the supposed gun shots that had sparked the panic in the village, I still don’t know what actually happened. That night was a reminder of how quickly the atmosphere can change in some of these countries. The next day there was panic buying of food before everything closed as people worried about what lay next. We helped get supplies for the hostel and went to Las Peñitas to wait for any news and think over what to do. None of the taxis were willing to risk driving to the airport in Managua as we contemplated getting a flight out the next day. In the end my friend and I managed to get a spin at 5am the next morning to Honduras, the owner of the hostel’s dad had to get to get there for work. We got across the border and then took a 5 hr bus to Tegucigalpa, the capital of Honduras. Looking back now at that night I think the local reaction shows just how tense the situation is in Nicaragua. You have to remember that it is not that long since their civil war ended so the memories are regurgitated in an instant. Judging by the news headlines things have only got worse there. And given how little global media coverage there was when I was there, it is likely the situation is much worse than what we read. We were just happy to get out of there, whether the danger was real or not. There was definitely a sense of relief when we get across the border; it was tiring, everyone constantly talking about what was happening or how bad things might get. Ironically, we were also arriving in one of the most dangerous cities in the world. We joked that we’ll be the guys that bail out of Nicaragua only to arrive in a more dangerous situation in Honduras. 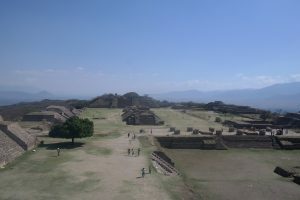 But it actually turned out to be a few good days there and the people we met were very nice. From Honduras we got a bus to San Salvador in El Salvador, my friend flew to Mexico and I continued travelling around El Salvador. “Don’t skip it” is the tag line used to promote the country to backpackers as it tends to be a country that backpackers pass over. I had been to the well-known beach spots previously and I hadn’t really thought about going back to the country but I am glad I went back. This time I covered more of the interior and the scenery is amazing, the lakes, mountains and volcanoes. Again, the people are just so friendly. 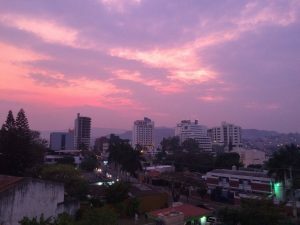 After El Salvador I flew to San José, Costa Rica, a city that is much more Americanized. I was staying in a hostel there that had spectacular views of the city and the surrounding mountains. For the view alone it was worth staying there. 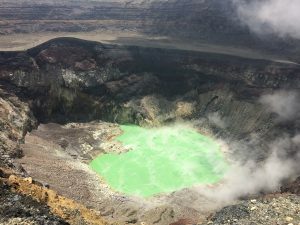 On this trip travelling around Costa Rica was not what I wanted to do so then it was just a case of figuring out where to next! The day or two before I flew to San Jose I booked a flight to Colombia with a layover of a few days in Panama but it was only a few days later I noticed an email from the airline saying they had not been able to process the reservation. So in San Jose I had a rethink on what I really wanted to do next. Flying to Colombia and making my way down South might have been more logical but I just felt like living in Buenos Aires. 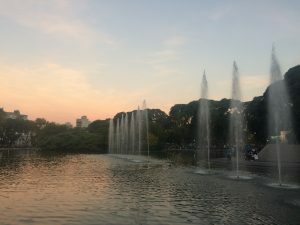 So I booked a flight to Buenos Aires and a house share on Airbnb in a nice area of the city for a month, in order to live with locals and get a real sense of the place. Also, bear in mind English tends to be spoken most in the hostels travelling so I was also keen to get back into the Spanish immersion, living in a place rather than moving around every few days. I arrived May 6th which just happened to mark one year since I left Ireland; it felt like I was starting a new adventure. Walking around Buenos Aires those first few days I felt a real buzz. I think it was partly because it was so last minute that I made the decision to fly down here. That freedom to just book a flight and the next day you are living in one of the coolest cities in the world. That’s priceless. 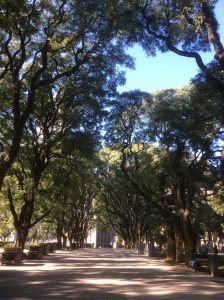 I came to Buenos Aires with high expectations and I have not been left disappointed. The city itself has so many picturesque neighbourhoods, the trees and parks everywhere add character and a nice vibe to the place. I have made use of the bicycle lanes that are all over the city, cycling around on a girl’s bike (in poor condition with no gears) that we have here in the house. Needs must! When I think Argentina I think football, the highlights of Maradona’s hand of god against England but most of all, his spectacular dribble goal in the same game on their way to eventually winning the World Cup in 1986. Of course then there is the magic of Messi, ‘a player from another planet’. They are football crazy here, it is great! The atmosphere for the Champions League final was epic even if the game was a disaster! One of my highlights living in Buenos Aires has been playing football with a team in the Province, about an hour outside the city. It is the small things. 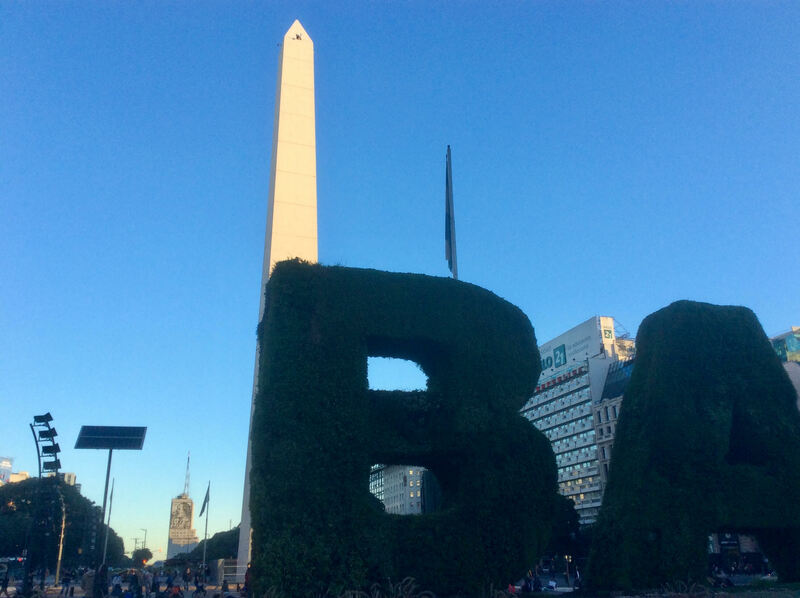 Of course the country is also famous for its meat and Argentinians are proud of their asados to say the least, their style of BBQ, where they slow cook a phenomenal amount of meat. It is not only the cooking it a real social event to have an asado. They’ll ask you ‘have you had an asado?’ It is a must here. I have been to a few but the one the football team put on last Saturday was some feast. 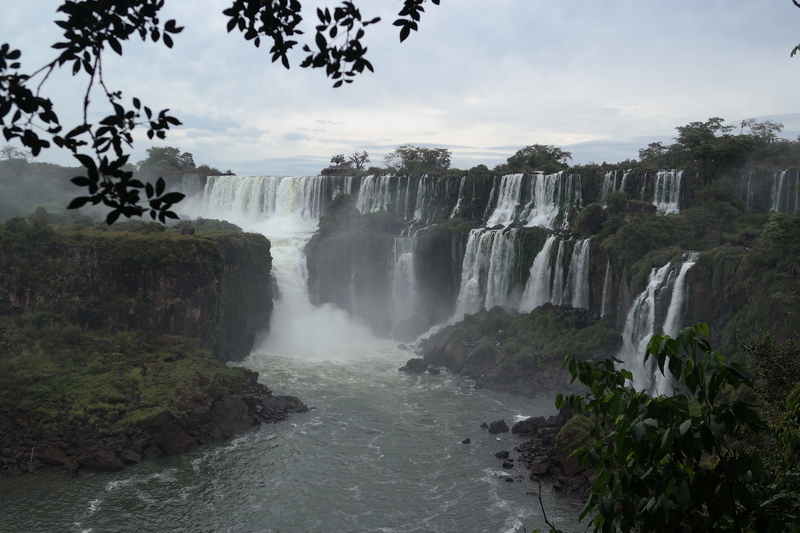 I intentionally wanted to spend the full month in Buenos Aires rather than moving around but I did take a trip to Iguazu Falls, less than a two hour flight from the city. What a place; the photos or anything I could write about it would not do it justice. It is simply to be experienced, nature at its finest! While they are crazy about football here politics gets them just as animated and speaking to locals it is clear that Mauricio Macri’s government is deeply unpopular. Protests are the norm here. The owner of the house I am living in is a lawyer working in the public service and I have had some really interesting conversations with her about the politics in Argentina and the history. I have also met with some people working in the investment industry to get their insights. Another currency crisis has been unfolding while I have been here and it has been interesting to hear the anecdotes from the 2001 crisis. The Peso has fallen 25% against the US Dollar over the last month even as the Central Bank of Argentina burnt through a chunk of their USD reserves trying to halt the decline. Imagine five years ago one US dollar was worth the equivalent of around 5 pesos whereas now it is trading around 25 pesos! Pre the 2001 crisis the exchange rate was 1:1. No wonder they are so obsessed with the US dollar here, it is a store of value for Argentinians as they have no faith in their own currency. So while locals will complain about Macri being a US puppet, ironically their own preference to hold US dollars over the Argentinian peso accentuates the pressures on the local currency. But you can’t blame them for not wanting to hold Pesos. Years, maybe decades, of stability will be needed to restore any kind of trust. Overall, it is clear that significant challenges lie ahead for the Argentinian economy and from what I can see the biggest cause for worry when contemplating the outlook for the economy is that very little consensus exists among the key stakeholders on how best to address those challenges. I haven’t just been living the life of a vagabond. A project that has occupied a large amount of my time this year is the development of a new website dedicated to the concept of social impact. It has been an interesting project on a number of fronts, research, writing, designing and developing the website. The general idea of the website is to provoke thought on what social impact means and the power of the individual to make an impact, covering key elements that will be instrumental to making social impact ubiquitous in all decision making. Ideally I would like to develop it as a medium for sharing thoughts, information and ideas related to social impact with the hope that others share their experiences and perspectives. On Wednesday I fly to Santiago, Chile where I plan to spend eight days before getting a bus through the Andes (which looks amazing) back into Argentina, to Mendoza and then head further north via Cordoba. 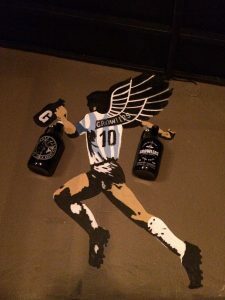 Time wise I am not sure but I definitely want to be in Argentina for at least a good chunk of the World Cup. I want to see Messi lift the World Cup but I think the team is not good enough. Still, six games to win the world cup, a mini liga. Vamos Leo!